When we think forward or look back, we often reflect on how happiness fits into our lives. 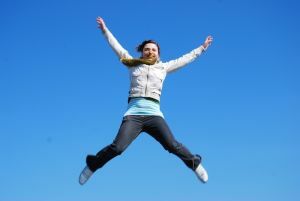 The pursuit of happiness is one of the most common goals of new psychotherapy clients. “I just want to be happy” is a well-heard phrase. So how can we be happier? What does the research say? Barbara Fredrickson at the University of North Carolina found that thinking positively has a positive effect on the body as well as the mind. Her research showed that positivity decreased blood pressure, pain and susceptibility to colds and increased sleep. Cognitive Behavioural Therapy, for example, highlights techniques that aim to lift mood by counteracting unhelpful thinking, such as over-generalisation and taking things personally. Daniel Gilbert from Harvard University explains why doing is better than not doing. Studies show that people tend to regret not having done things much more than they regret things they have done. This is perhaps because it is easier to accept doing something we regret, as we consider ourselves active and courageous. We can console our regret by thinking about what we have learned from the experience. Daniel Goleman, Psychologist and author advocates the benefit of meditation. He writes: “Meditation helps us better manage our reactions to stress and recover more quickly from disturbing events. This is key to happiness.” Goleman cites a study where workers in stressful jobs practiced mediation for eight weeks. After just two months they felt happier and reported they liked their work more. One way to consider happiness is the ability to recover quickly from upset. Goleman advises that when we start to get upset, let go of the negative thought, deal with the problem and then let go of that too. Paul Gilbert, from the University of Derby, UK, highlights how important it is that we relate to ourselves with kindness. When we are self-critical we damage our wellbeing, contentedness and ability to cope. Jonathan Haidt, a Psychologist at the University of Virginia, emphasises the amount of time we spend doing things that give us personal meaning and a sense of connection. He cites quality time with loved ones, holidays and other enjoyable activities. Becoming involved with something you believe in, such as religion, politics or teaching or doing something creative are also good examples.